Just to avoid any misunderstandings: I do not believe that the sky is populated by flying saucers piloted by little green men having antennas instead of ears, and I also don't believe that we are being invaded by spaceships "from other dimensions", or anything like that. But occasionally I do see something interesting in the sky, and I'm puzzled what it is. As long as its true and certain nature is unknown to me, and if with some stretch of phantasy it can be considered to be flying, it is an Unknown Flying Object, by definition! I'm located at roughly 39 degrees south, 72 degrees west. From this viewpoint the object was roughly at an azimuth of 310 degrees, elevation of roughly 45 degrees, but I didn't measure those, they are just estimations. In UTC, it was 2012-JAN-13, 01:52. That was a little less than 2 hours after my local sunset. The lens used for all these images has a focal length of 180mm, and the camera has an APS-C sensor of 12MP. All images on this page are crops of the full frames. The exposure time of this photo was 4 seconds, so you can calculate the angular dimensions and speed from the elongation of the stars and the object nucleus. Note that the object has an apparent motion several times as fast as the stars, and in almost exactly the opposite direction. 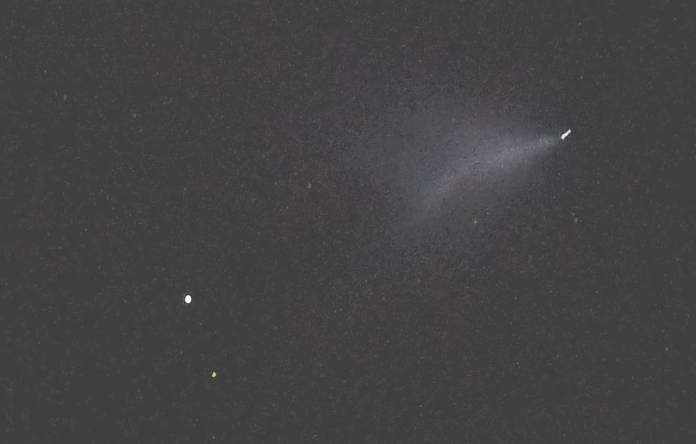 The object looks a bit like a comet: A bright nucleus, with a fainter but very visible tail. But it moves far too fast to be a comet, and its tail seems to point approximately toward the sun, not away from it. On the other hand, it moves much slower than a satellite in low earth orbit. So, it looks like this thing is in a higher earth orbit, but still well below the geostationary level. My guess at that point was that the object is a new satellite, caught in the act of using its rocket engine to move from a provisional low orbit upward to its definitive orbit! 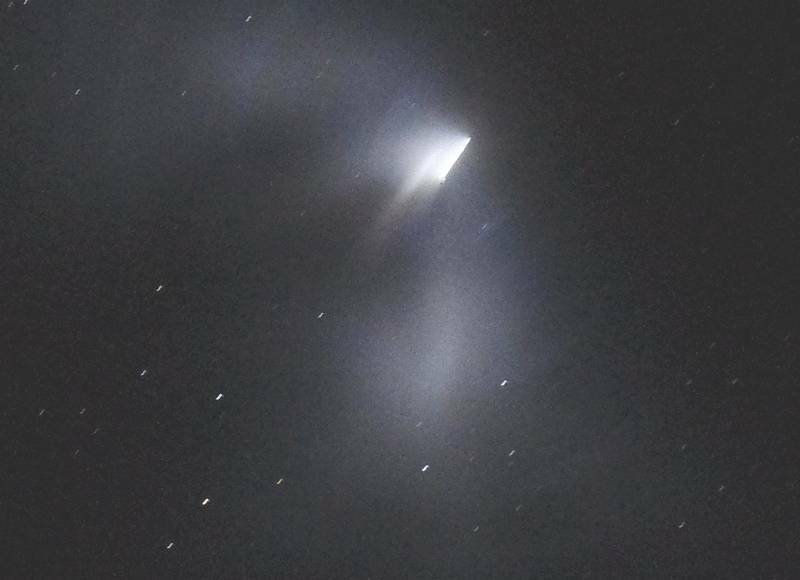 Judging from where it appeared in the sky, it could have been roughly in an equatorial orbit, moving west to east. That's consistent with a satellite intended to end up in geostationary orbit. 16 seconds later, and seen in a smaller crop. The exposure time is 4 seconds again. Compare to the previos image, to see how the object moved, relative to the stars. It's interesting to see the cloudlike blobs. These don't seem to be artifacts of the camera or lens. I couldn't get any such ghostlike things from any other bright objects. So they seem to be real. Could it be that such a satellite uses several big thrusters pointing in significantly different directions? I don't think so, because that would be wasteful of fuel. So I don't have a good explanation what these clouds are. I then switched to 1 second exposure time, to avoid stretching out things so much. Here is a picture taken more than 4 minutes after the previous one. It also has the full pixel resolution. Note that the nucleus apparently has become far shorter, due to shorter exposure time. But it also seems to be getting much weaker, and it has shrunken more than by a factor of 4! So it's clear that it's moving away from me. It was also moving "up" in the sky, getting closer to my zenith, still in a mainly northwest azimuth. It's interesting to notice that there seems to be a second, smaller object behind it. Maybe that's the plume of a smaller thruster that was being pulsed to make course corrections? I would also like to understand why the main plume seems to be at an angle of about 45 degrees to the direction of travel! Now the plume seems to be a bit better aligned with the direction of motion, but still not as straight as it should! The object is also becoming quite faint. It was already hard to see with the naked eye. And the last photo, taken roughly 11 minutes after the first one. 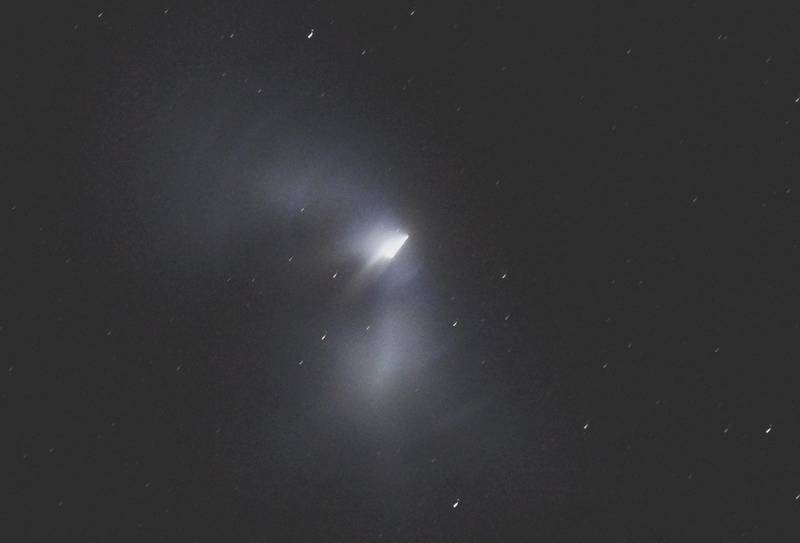 Also at 1 second exposure time, and full pixel resolution. The object was now roughly 70 degrees high in my sky, and I was getting into trouble seeing it, because I was shooting through a window (it was open, of course!!! ), and the overhanging roof was about to block the object. Well, that's it. Can anybody out there tell me with certainty what exactly it was? About 12 hours after shooting these photos, and a few hours after setting up this web page, information came in. 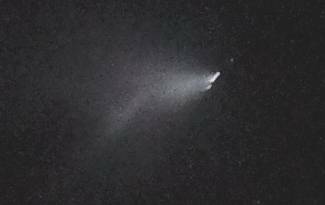 The UFO has turned into an IOO: An Identified Orbiting Object! It's the launch rocket's upper stage of the FengYun 2F satellite. This new weather satellite was launched from China at 00:56, into a geostationary transfer orbit. That's a highly elliptical orbit, with an apogee roughly at the geostationary orbit altitude, but a very low perigee of only a few hundred km. According to the information I got, the Long March rocket burned for about 20 minutes to place the satellite in this orbit, so the burn should have ended almost half an hour before my first photo. According to the first set of orbital data available, when I shot the first photo the object was at an azimuth of 294 degrees, and an elevation of 42 degrees from my place. At the time my last photo was shot, the object was at 311 degrees azimuth and 54 degrees elevation. This agrees roughly with my (estimated) position data, but specially the elevation of only 54 degrees at the end shows less good agreement with my observation of the object getting hidden behind the slightly overhanging roof of my home. I think it was higher. If updated orbital data become available before the satellite is moved to its final orbit, I will re-check this. If it still disagrees, I will have to take out a tape measure and a calculator, and find out at what exact elevation that overhanging roof starts blocking my view! What was it, exactly, what I saw and photographed? Of course, the straight bright line showing up in the photos is a point-shaped object that's moving fast, so that it gets elongated due to the long exposure time of 4 seconds (in the first pictures) or 1 second (in the last ones). That object would probably be the upper stage of the rocket, which must be roughly 3m in diameter, and perhaps 10m long or so (I'm just guessing). And surely it's shiny bright, so it's very visible when the observation conditions regarding sun angle and such are optimal, and they were. And the small object that's visible too in some photos might be the satellite, but more likely it's just a star that happened to be just behind the rocket. Because it should be elongated just as much as the main object, if it really were the sat! The problem is that my digital camera does who-know-what digital processing, even to the supposedly raw image, so one can never be very sure that what one sees on the photo is really what was there. It's not like with good old fashioned film photography! The larger question still remaining is what this large cloud was. Does some of the exhaust smoke (water vapor, in the case of this hydrogen/oxygen upper stage) stay in orbit closely behind the rocket? 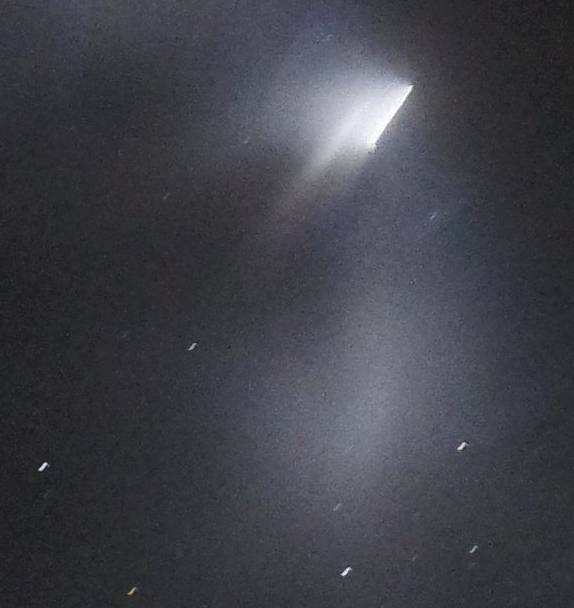 Or was the rocket jettisoning a surplus of unburnt fuel? I don't know. In any case, it was a nice sight, and I was lucky to notice this UFO IIO in the sky!